When Guy Ritchie’s Sherlock Holmes raked in more than $200 million at the box office in 2009, it was only elementary that Hollywood would use its powers of deduction to realize that a sequel was inevitable. It was far from inevitable, however, that the people involved in making that sequel would make any effort at improving the product. Never mind that Sherlock Holmes was kind of a mess, its last hour overloaded with fights, explosions and that fast-slow-fast visual style that has become so achingly trendy. You don’t generally mess with (financial) success. Give director Guy Ritchie credit, then, for tweaking the formula in Sherlock Holmes: A Game of Shadows and coming up with something considerably more satisfying than its predecessor. It’s actually a lively piece of entertainment rather than an endurance test. 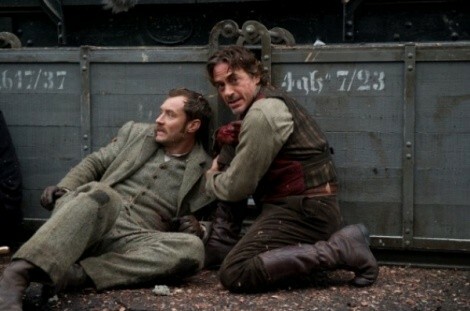 In the first place, screenwriters Kieran and Michele Mulroney have provided a more streamlined plot for Holmes (Robert Downey Jr.) and Dr. Watson (Jude Law). In 1891, a series of bombings have pushed Germany and France to the brink of war. Holmes suspects that Professor James Moriarty (Jared Harris) is somehow involved, but he requires assistance in his investigations. And it might be difficult to convince Watson to participate, since he’s on the verge of getting married to Mary (Kelly Reilly) and retiring from the criminal-chasing business. You only need to notice one name in the above synopsis to realize another significant advantage A Game of Shadows has over the earlier Holmes: the presence of the great detective’s greatest enemy. Harris’ Moriarty lingers on the sidelines for much of the film, but when he does get involved, he’s a terrific, stakes-raising protagonist, the kind who can deliver a menacing speech with calm conviction. Sherlock Holmes deserves better than the spunky ex-girlfriend and occult-promoting nobleman he was stuck with in the first film, and he gets it here. Ritchie also appears to have figured out what works and doesn’t work in his attempt to create a Victorian-era James Bond setup. In true master-villain tradition, Moriarty gets a worthy henchman—the sharpshooting Col. Moran (Paul Anderson)—who’s nearly as threatening as the head honcho himself. The action-set pieces go big when Ritchie does want them—Holmes and Watson fighting off a squadron of assassins on a moving train; Holmes chasing down an acrobatic Cossack through a multilevel gentlemen’s club—but except for a mortar-bombed escape from a munitions factory, they’re rarely poured on so thick that nothing else can escape from their pull. It’s also an admirable nod to the history of the characters that the climactic showdown between Holmes and Moriarty takes place almost entirely within their minds, as they plot and counter-plot how the showdown is likely to play out before any real-world confrontation takes place. It’s also noteworthy that despite the presence of Noomi Rapace (Lisbeth Salander from the Swedish The Girl With the Dragon Tattoo) as a gypsy who assists our heroes, Holmes has no romantic interest in A Game of Shadows. That’s because the film commits rather boldly to its identity as a more-than-casual bromance between Holmes and Watson. Downey has fun with Holmes’ subtly petulant response to being abandoned by his partner, and it seems no accident that when Holmes is rescuing Watson during his honeymoon—throwing his new bride from the train in the process—he’s disguised as a woman. The two men even share a formal dance as they try to sort out the details of Moriarty’s plans. The smart focus on their nebulous connection keeps the characters and their crisp banter at the center. Ritchie being Ritchie, the action he does include often feels more frantic than truly exciting, chopped into micro-fragments of punches and gunshots. Some of the supporting characters are wasted—including Rapace and Stephen Fry as Holmes’ brother, Mycroft—and Holmes’ triumphant explication of his cunning plan near the end makes no chronological sense if you take even a moment to think about it. But for significant stretches uninterrupted by pointless bombast, A Game of Shadows is fun, witty and—perhaps most shocking of all—occasionally restrained. It’s almost enough to inspire anticipation for a couple of years from now, when the game once again will most likely be afoot.